*The inspiration for this post and the words and comments came from the excellent Strongtowns blog, and a post written by Gracen Johnson. One of the more interesting challenges of living somewhere that is a high development area, is not the density, construction, or traffic, it is trying to ensure that in the rush to build, there is more than a hat-tip to quality of life. Boulder and surrounds are synonymous with open space, and trails. All the developments adjacent to my neighborhood has trails and reasonably close access to open space, usually via trails. However, in a development with more than 120 single family homes, our developer has provided nothing to build or foster community, a far as I’m aware not a single swing or slide has been added. Immediately adjacent to our development, North End Phase II/III, the same developer is applying to build another 78-dwellings, including single family, duplex and triplex homes. The development will for sure attract families. I reviewed the plans, and there it was, adjacent to the power line trail, a lonely out-crop of the development, and almost immediately under overhead power lines, a “covered picnic area and table”. I thought this would be a good opportunity to challenge the developer and Lafayette Planning Commision to provide something better. This is especially relevant, as the developer is seeking reduced lot sizes, and higher density. Meaning the back yards will be smaller, with less room for children to play. Using pictures of what the developer has done on our development, I spoke before the planning commision last Tuesday (May 24th). “Mr Chairman, Vice Chairman, and Commissioners, thank you for taking time to let me speak tonight. I’m Mark Cathcart, a new resident of Louisville CO. I live in the North End Phase II Development, just 250 yards immediately west of the proposed Blue Sage development. As you know, North End and Blue Sage are from the same developer. 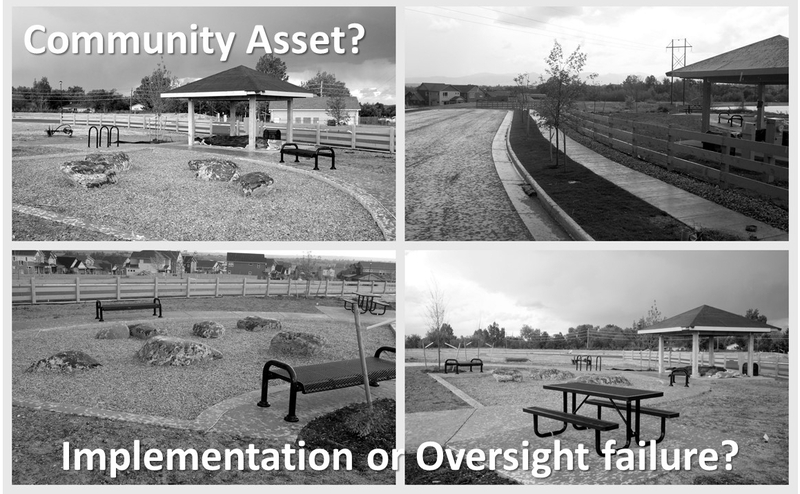 At least in the North End Phase II development, the Public open space and community assets are disappointing. While I’m sure the developer would argue otherwise, realistically I doubt any of the residents would. Not a single swing or slide has been added, we have Hecla Lake, which would have otherwise been difficult to develop, mostly due to the adjacent power lines. We have a drainage ditch that masquerades as an open space, and a pocket park, similar I would guess, to the one being proposed for the Blue Sage development. The question is why would you want to sit here? Would you let your toddlers and young children play on the Boulders, helpfully surrounded by bark to break their fall? I admit, this isn’t finished, the pictures were taken this afternoon. There is no allocated public parking, and no play area, it is adjacent to the water pumping station and to North End Phase III, and what are likely to be the 10-most expensive houses, I would guess over a million dollars each, in the entire North End development. Allowing pocket parks like this stay under HOA control, limits almost any future improvement. In some circles, this would be called defensive architecture, deliberately unappealing. The top picture is from Blue Star Lane, south west of the Blue Sage development, looking into the open space to be developed. We (often) demand developers throw some cash toward green space or public amenities in order to get approval for construction. You see it all the time in subdivisions with exquisite landscaping, pocket parks, and benches that are only appreciated from behind a car window or on the planning application. 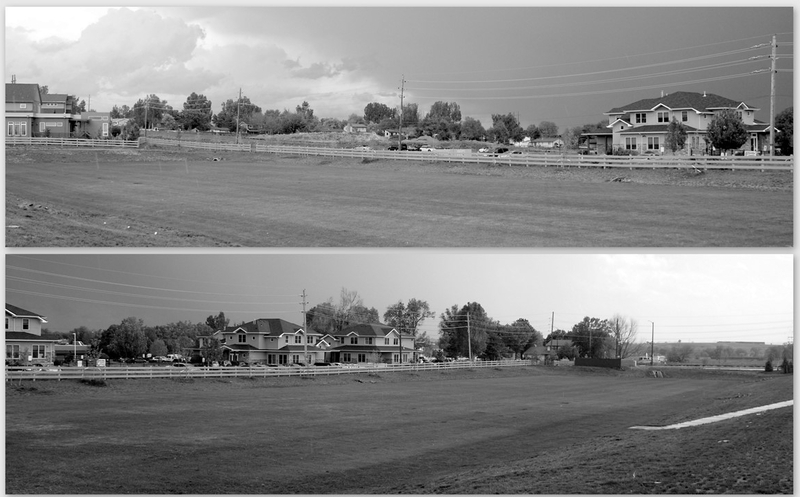 The bottom picture is taken from the north west of the open space, looking south east to South Boulder Rd. We should spend our time obsessing why there are no people here, rather than what they might do wrong if they showed up. Yes, Waneka Lake Park is just over a mile away from the development via the trails, but how much parking does it have and how many children can the play area take? Although the sketch plan proposal was approved, enough members of the planning commision asked for a better park that the developer will be expected to make some changes. We’ll have to wait and see what they come up with.